whose voice was warm like sunshine. is always finest with friends." ... like the tang of pickled plums. Sakura misses her grandmother and the bento-box picnics, her playmates and the cherry trees. But she befriends a solitary boy in her neighborhood, one who shows her the millions of stars to be seen through his telescope. but we still see it." And when Sakura travels back home to see her very ill Obaachan, she is again sad, but she thinks of those old stars whose light is still traveling toward earth, and when spring comes, she discovers that her new home has trees blooming everywhere and some have cherry blossoms to share with friends. 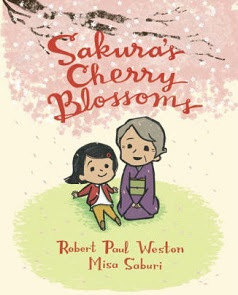 Robert Paul Weston's Sakura's Cherry Blossoms (Tundra Books, 2018) deals simply and poignantly with loss--loss of home, friends, and grandparents--with the cherry blossoms serving as the symbol of lasting love and beauty in life. Life blossoms everywhere, and Sakura finds new friends to share the cherry trees with her. Weston tells his story in the unique Japanese poetic form of tanka--a three-line haiku, followed by a two-line summary, all in thirty-one syllables. Mika Saburi's child-centered illustrations are unusual, done with thick black lines and both strong and pastel colors and widely different perspectives, from bento lunches to starry space, which echo the theme of both gain and loss, happiness and sadness, the old and the new.